Fleetwood Mac News: STEVIE NICKS Nominated For Induction Into The Rock & Roll Hall of Fame! 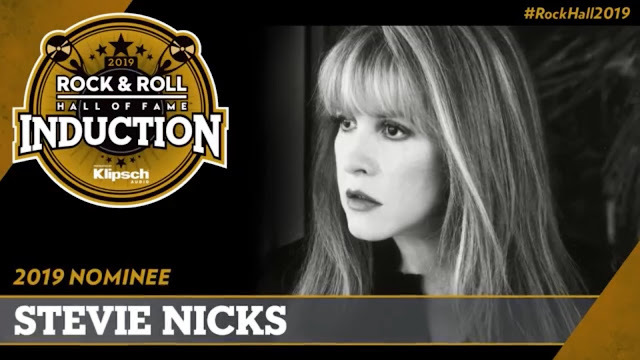 STEVIE NICKS Nominated For Induction Into The Rock & Roll Hall of Fame! Stevie Nicks is nominated for induction for the first time as a solo artist, having previously been welcomed into the Rock Hall in 1998 as a member of legendary rock group Fleetwood Mac. If she makes the cut when the 2019 class is announced in December, Nicks will become the first female artist to join the Hall a second time. Starting Oct. 9, the public can visit rockhall.com/fanvote to cast their votes for who they would like to see in the Class of 2019. Voting ends Dec. 9 and the top-five artists will make up a fan's ballot, which counts as a single vote. VOTE: Go to rockhall.com/vanvote for fan vote. You can vote once per day. Below are some early stats as of this posting... But it's early, we gotta stay on top of this.